Smile, even when you’re turning sixty. Minnesota Prairie Roots file photo. I remember feeling the same when I reached that landmark birthday. And to think I struggled with turning forty. I wish now that I was only four decades, rather than six-plus decades, old. But there’s something to be said for this age. And I can summarize that in a single powerful, joyful word: grandma. Julie and I, who have been friends since our kids were in grade school, are both relatively new grandmas. Her grandson is 14 months younger than my almost 2 1/2-year-old granddaughter. We trade stories now about grandchildren and share images of the cute little ones who bring us much happiness. Julie and I have been through a lot together. Joyful times and difficult times. We listen to one another and trust each other. With anything. What a blessing she has been in my life through rearing children and now into loving grandchildren. On this her 60th birthday, I want Julie to realize that turning sixty is really not all that bad. Especially when you have a grandchild to spoil and love. Happy birthday, dear friend! I wish you many more years of joyful living. VALENTINE’S DAY BRINGS expectations of love expressed in some perhaps grand way. It’s a great day for florists and chocolate shops and restaurants. And that’s alright. Both flowers and candy are visual reminders of love. Dining out allows time to connect and celebrate. I have a half-dozen red roses on my dining room table. And I appreciate them. But even more important are the everyday moments of love. You know, those little things you take for granted in your life. Or the surprises that cause your heart to surge joy. a bag of macadamia nuts, a gift from my eldest and her husband who recently vacationed in Hawaii, a place I will never visit. my husband washing the dinner dishes every Sunday so I can phone my mom at 6:30 p.m.
a friend buying valentine books for my 10-month-old granddaughter whom she’s never met. Downtown Fargo, North Dakota, the real Fargo, not as depicted in the movie or TV series. Minnesota Prairie Roots file photo. Today, please express your care and appreciation for your friends, your family, and, yes, even for those outside your closest circle. Try to make that a practice every day. Happy Valentine’s Day, dear readers! I appreciate you. WHAT ARE YOU EXPECTING for Valentine’s Day? You can’t go wrong with a box of chocolates. Minnesota Prairie Roots file photo. 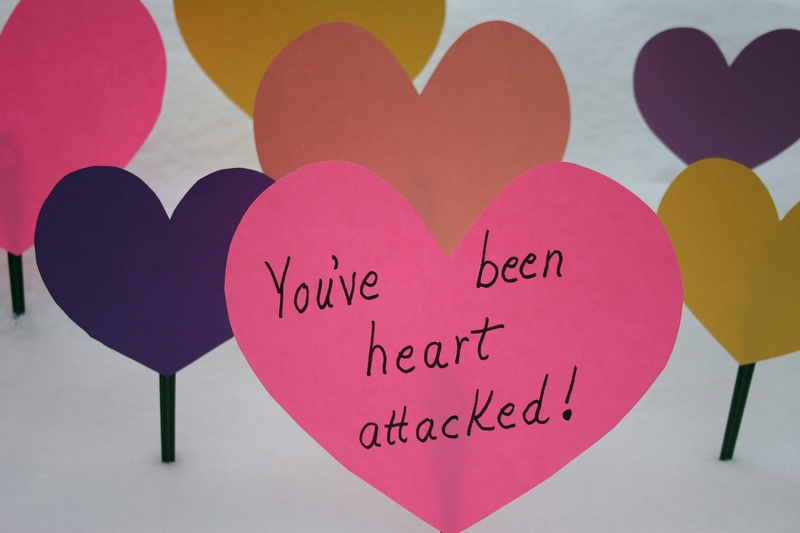 Some creative mind (not mine) came up with the “You’ve been heart attacked” idea. Minnesota Prairie Roots file photo. How about a heart attack? No, not the medical emergency that threatens your life. But rather a staged attack that plants paper hearts in your yard. 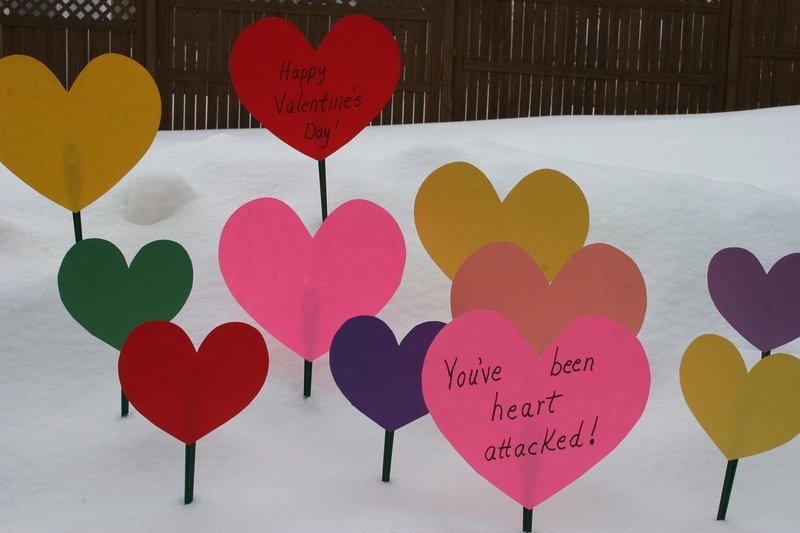 Imagine three times-plus this number of hearts placed in our friends’ yards. Minnesota Prairie Roots file photo. Two years ago, my husband and I crept into the front yards of two friends on the evening of February 13. 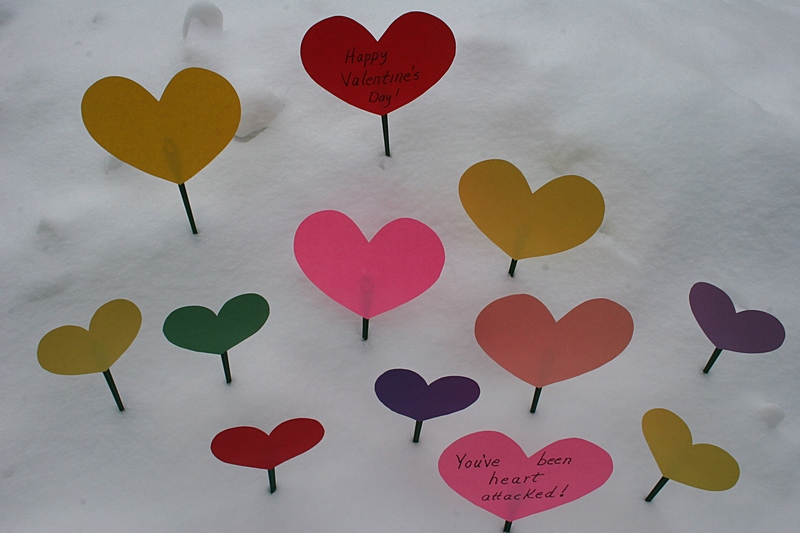 There we stuck colorful paper hearts into snowbanks with the message, Happy Valentine’s Day! You’ve been heart attacked! 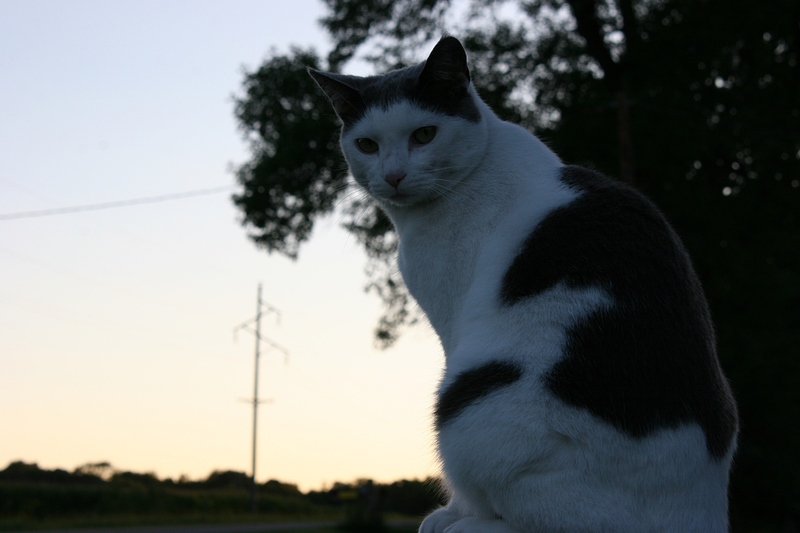 Then we fled into the darkness of a cold Minnesota night, hoping to elude barking dogs and porch lights. We succeeded. The two young families awoke the next morning to find dozens of hearts scattered across the snow. It didn’t take them long to determine who’d done this. And then, because they have such giving hearts, these families plucked up the hearts and heart attacked two more families. My husband and I got as much joy out of giving this Valentine’s Day gift to families we treasure as they did out of receiving. Piling up the hearts in anticipation of Operation Heart Attack. Minnesota Prairie Roots file photo. There’s still time to plan a heart attack. Click here for details. If you carry out a heart attack, please report back here in the comments section. I’d love to hear about your experience. 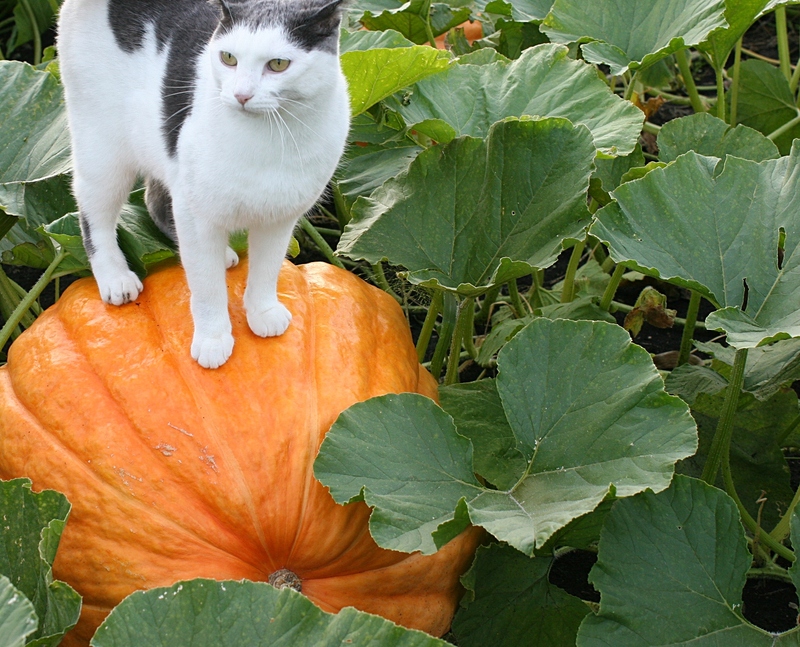 HAVE YOU EVER TRIED to coax a cat onto a pumpkin? It is difficult at best. I am not a cat owner. 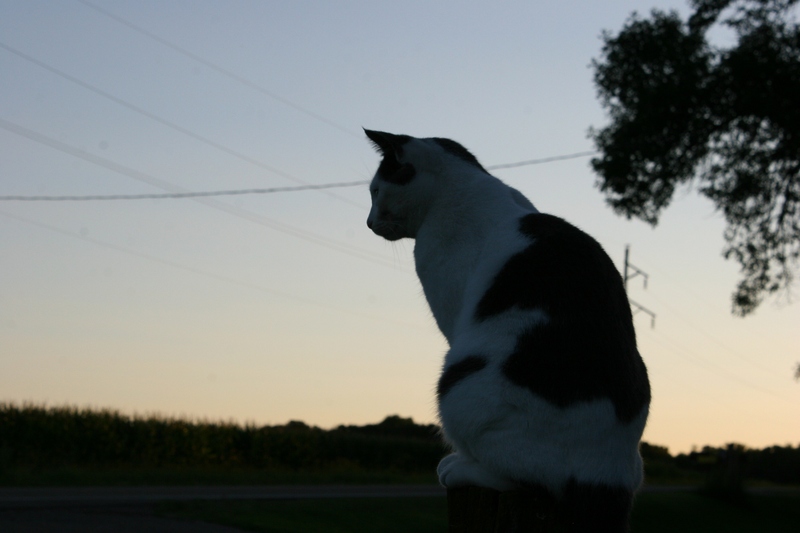 But I grew up with farm cats, simply calling, “Here, kitty kitty,” and the felines would come running. They did not, however, appreciate any attempts to dress them in doll clothes and then plop them into a doll buggy. 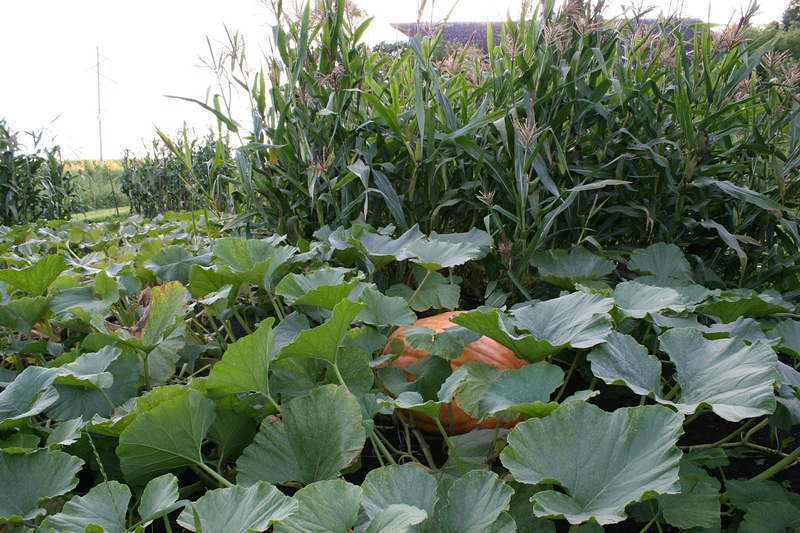 The sprawling garden includes pumpkins and popcorn. That “here, kitty kitty” tactic did not work with Gretchen, who belongs to friends, Jeff and Mandy. My bible study group gathered recently at their rural Faribault acreage. We always socialize for an hour before digging into our study. 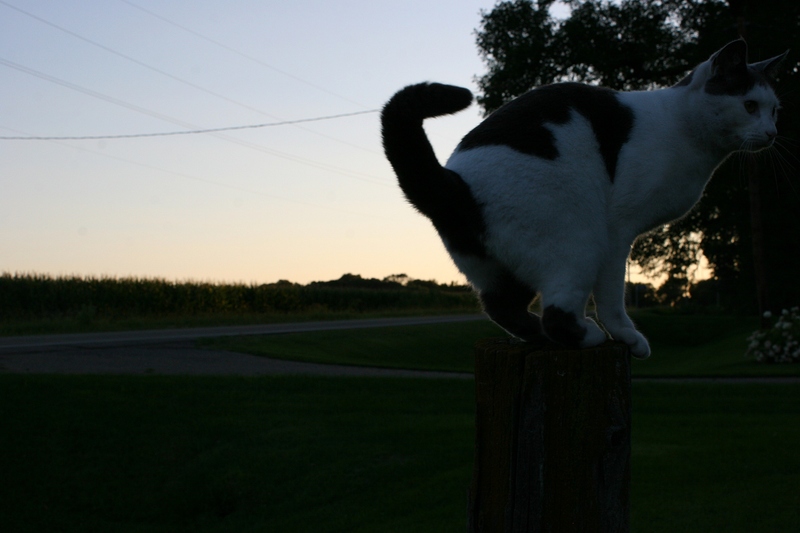 And on this perfect late summer evening in Minnesota, we surveyed Mandy’s garden. Gretchen meandered with us among the vines and rows. Mandy grows vegetables that I’ve never seen grown—like kidney beans and burgundy beans and tomatillos. 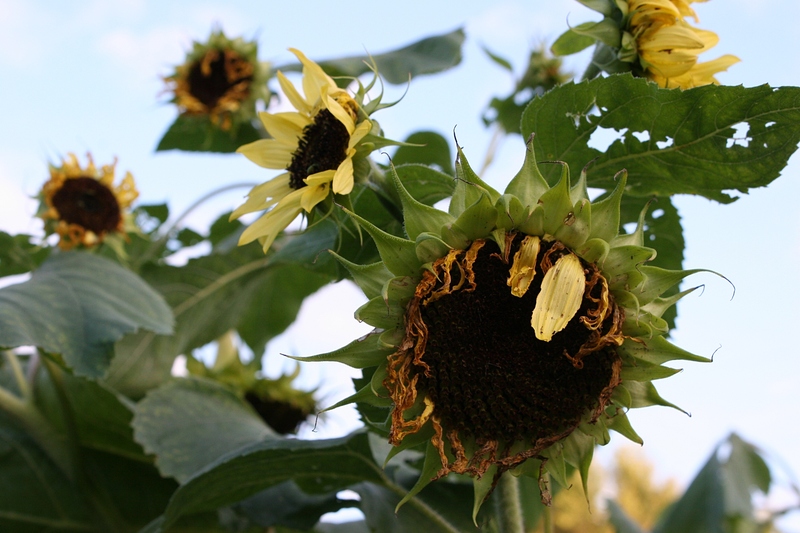 This year she’s had help from Hannah, a teen who wanted to learn gardening. Hannah planted pumpkins which just kept growing and growing and growing into ginormous orbs. I wanted to photograph them. But I needed scale. Ah, Gretchen the cat would be perfect. So Jeff, kind friend that he is, agreed to lure Gretchen onto a Great Atlantic (or something like that; Jeff couldn’t quite remember the name) pumpkin. Eventually I got an acceptable photo. When the photo shoots and garden tour ended, we began moving toward the house. But we were sidetracked. Debbie and I, dairy farmers’ daughters, checked out the barn. Most of the guys headed to a shed and scrounged in a scrap metal pile. Steve, the artist among us, found metal for art projects and a trough that will work as a flower planter. Then Mike and I waded through tall grass with Mandy, aiming for the wood pile. There we rooted out wooden boxes. Mike also found scrap wood for his oldest son’s May wedding. 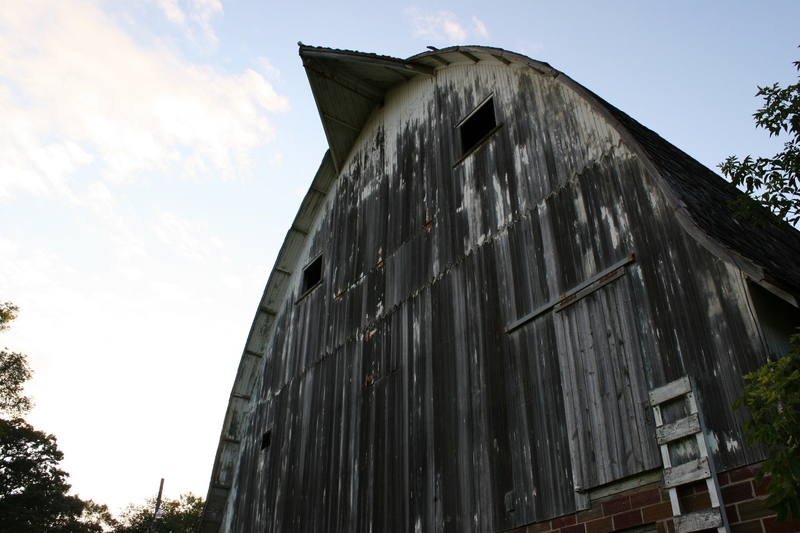 The barn rises high above the garden. One person’s junk is another’s treasure. 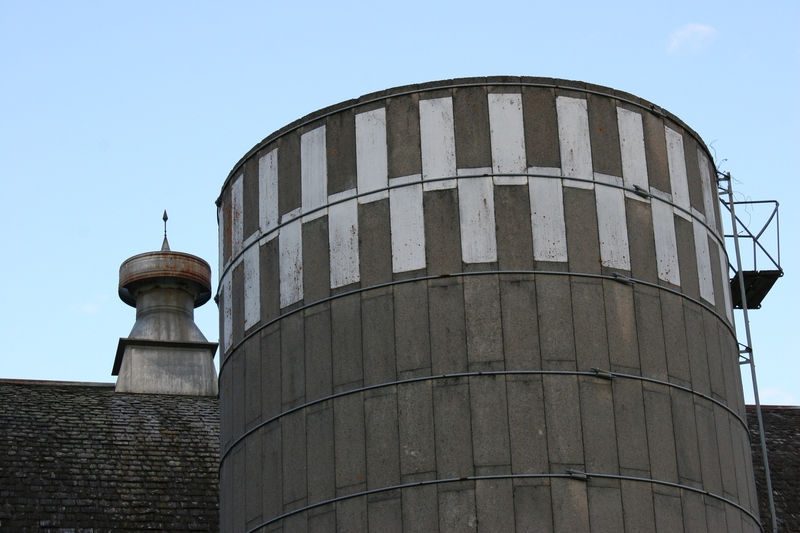 The top of the silo and the barn roof. What a fun evening it was, first touring and photographing the garden and Gretchen, then picking, then gathering around the kitchen table with dear friends to study, to share and to pray. I am blessed. Friends, Nimo, left, and Nasteho. 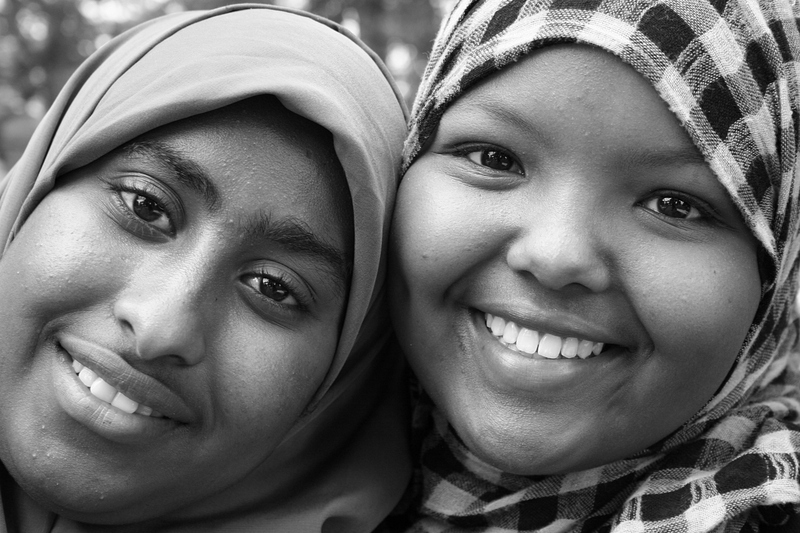 I’ll always remember that statement shared with me 2 ½ years ago by a then high school senior who asked me to photograph her and a friend at the International Festival Faribault. Nasteho, a native of Kenya, posed with Nimo for this beautiful portrait of the pair. They were among students volunteering at the fest. What Nasteho told me that August day in 2012 broke my heart. She’d been subjected to ongoing insults from a customer in her workplace, felt stares at the grocery store, been flipped the bird while driving. All because of the way she dressed, her skin color and her ethnicity. “There is no respect for Somalis,” she concluded. I couldn’t disagree with her. I’d heard the negative comments, too, about Faribault’s newest immigrants. Despite the outright prejudice Nasteho had already endured at such a young age, she did not appear bitter or angry, only desiring of respect and understanding. She seemed wise beyond her years. Poised. Thoughtful. Well-spoken. I recall thinking, if only those who hold disdain for Somalis could meet Nasteho. They would see her as the beautiful, young and spirited woman I photographed. It is the personal connections that bridge differences. I believed that then. I still believe that now. TWENTY-FOUR HOURS HAVE PASSED since the deed was done. Correction. Deeds. Plural. The covert operation began, as all such operations do, with a plan. Piling up the hearts in anticipation of Operation Heart Attack. Days before the staging, my husband and I (mostly me) traced and cut hearts from construction paper. Red hearts, pink, yellow, blue, purple, orange… The color didn’t matter as much as the quantity. All told, there were about 70 hearts in three sizes—half destined for each home. Then the search was on for stakes to which the paper hearts would be secured. The original intent was to purchase wooden skewers. But since this isn’t exactly grilling season in Minnesota, none were to be found. Clearance holiday light stakes worked perfectly. 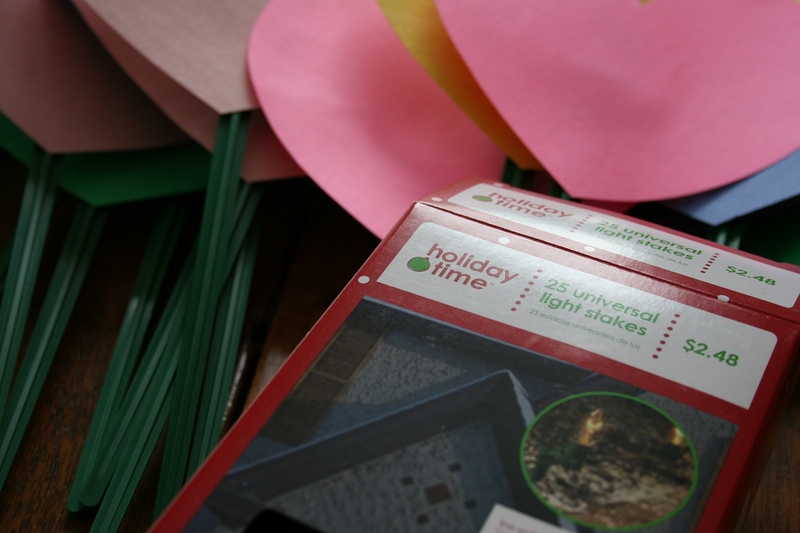 That left us wandering the aisles of Walmart, where I happened upon universal light stakes on the clearance shelves. These 9-inch long plastic sticks, typically used to secure Christmas lights in the ground, were on sale for the bargain price of 10 cents for a box of 25. I snatched three. 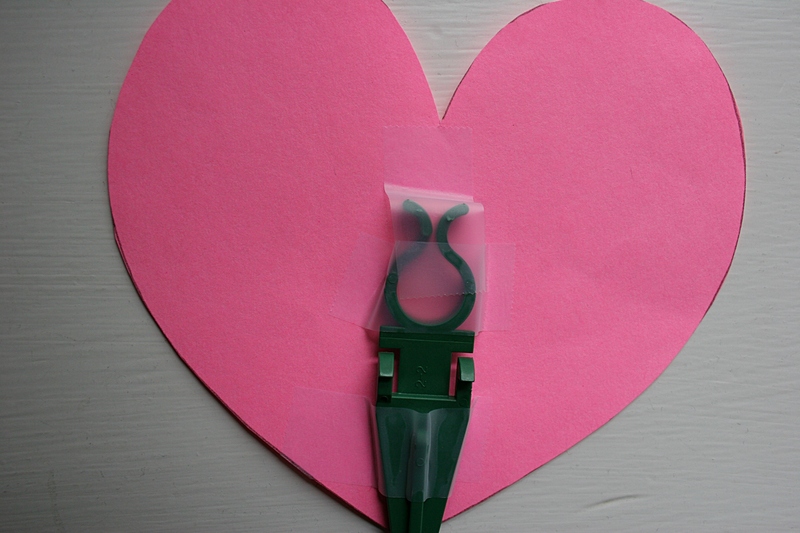 Each paper heart was secured to a plastic stake with regular tape. But would tape adhere and stick in Minnesota’s brutal temps? 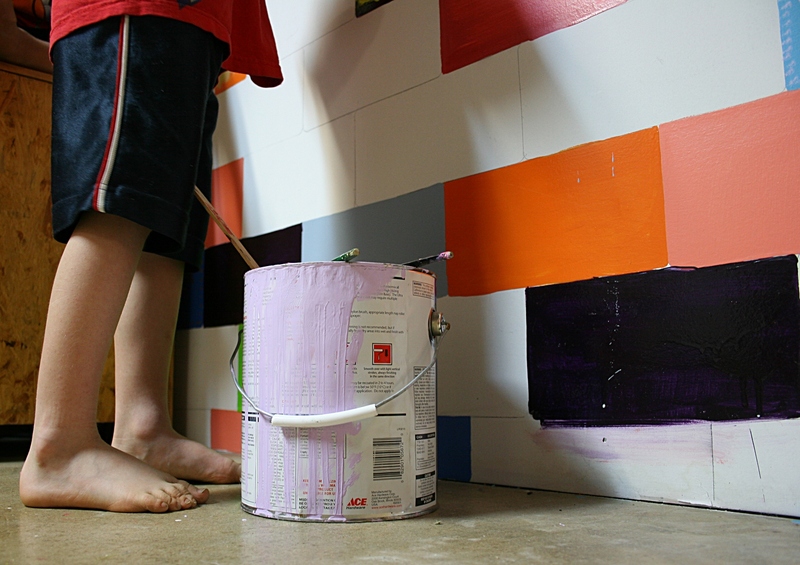 We tested regular tape, packaging tape and masking tape and rated the everyday tape as the best option. And so stakes were taped to hearts. On the morning of February 13, the day of Operation Heart Attack, I divided the hearts into two piles and later stashed them in canvas tote bags. That evening, around 7, Randy and I set out to place the hearts in the front yards of our friends. We knew we had to work quickly and quietly in the cold and darkness of a Minnesota winter evening. The plan was to park around the corner from the targeted homes. There was no need for such stealth at Billie Jo and Neal’s, though, as their house was dark. So Randy stopped the car right in front of their place along a quiet residential street. A day-time test run in my backyard as, obviously, I could not photograph the evening heart attack in progress. We hustled out and then begin stabbing the stakes into the snow banked along the edge of their driveway. We had not anticipated rock hard snow. But we managed and in less than five minutes were out of there, contemplating when our friends and their two elementary-aged children would discover they’d been heart attacked. Then on to the next house, where we did have to park around the corner and use extreme stealth. Our friends Tammy and Jesse had an exterior light switched on and their living room curtains partially open. They also have a dog. We thought for certain that we would be caught by them or one of their four children as we, once again, jabbed stakes into hard-packed snow. However, we made a clean get-away. 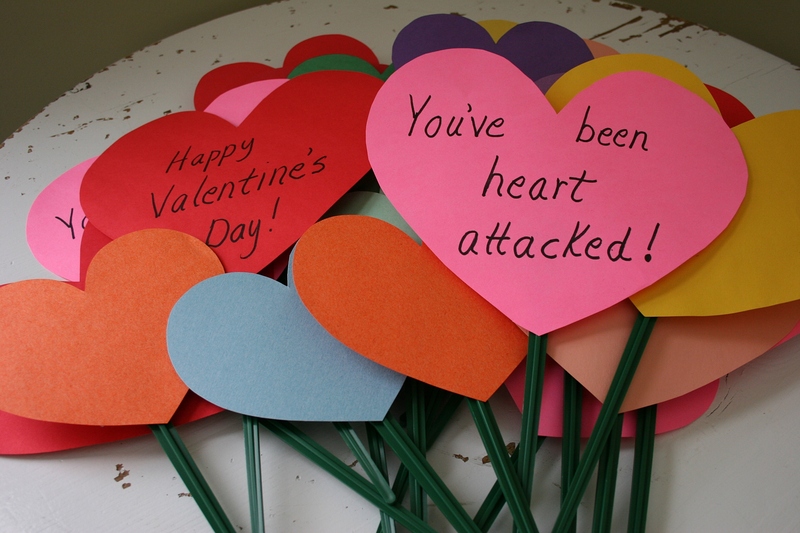 Some creative mind (not mine) came up with the “You’ve been heart attacked!” idea. Busted. No interrogation tactics needed. I confessed immediately. Seems Tammy and Jesse’s daughter, Hannah, discovered the clutch of hearts within a half hour of their placement when she let the family dog outside. Violet set up quite a racket barking at the fluttering hearts. Apparently she didn’t bark, though, when we were executing Operation Heart Attack. Good doggie. Then the mystery needed to be solved. And here’s the funny part. Tammy and Jesse and family thought Billie Jo and Neal and family placed the hearts in their yard. And Bille Jo and Neal and family thought Tammy and Jesse and family had carried out the attack in their yard. Ruling each other out, they eventually settled on Randy and me as the likely suspects. Imagine three times this number of hearts placed in our friends’ front yards. Both families have since pulled up the hearts we left and heart attacked others. I cannot claim credit for the Operation Heart Attack idea. I saw this online. But I will accept the grateful thanks of my friends for making their Valentine’s Day a memorable one. And Tammy claimed she and her kids had a blast sneaking out to a place in the country and passing the hearts on to mutual friends of ours. Oh, the joy in something as simple as a heart attack. 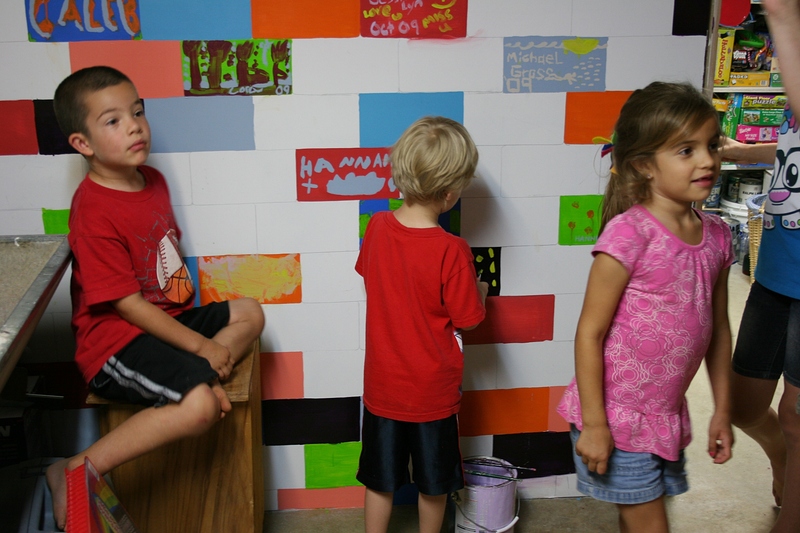 The kids, Braxton, left, Jack and Nevaeh, were thrilled to paint blocks, unlike me. I SWEAR SHE would have locked me in the basement. 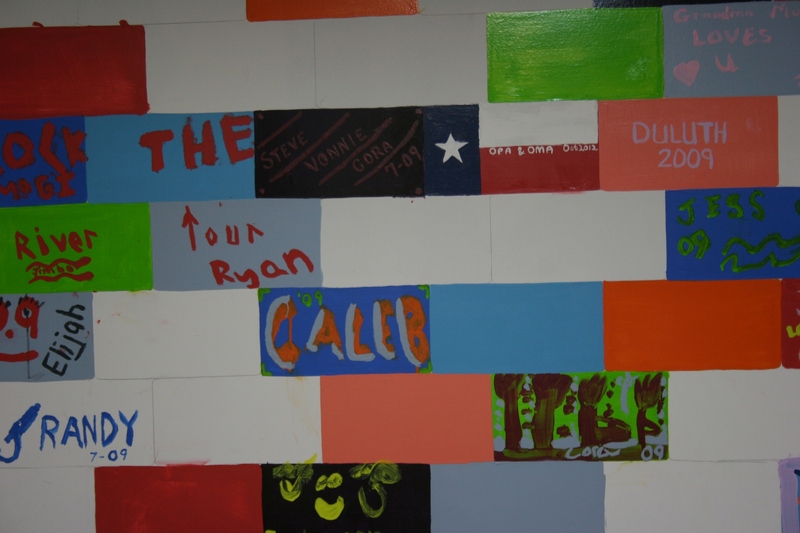 The paint comes from the county recycling center. 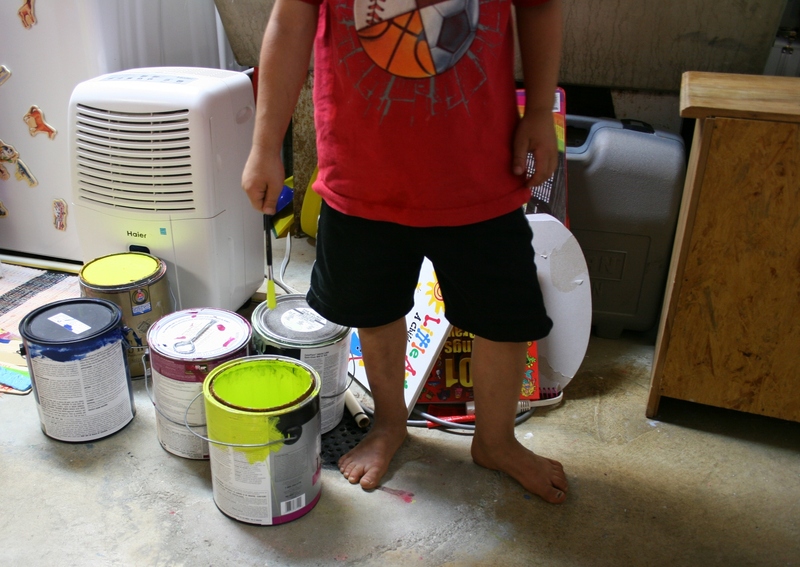 There was no wiggling my way out of her demand, even if my friend was preoccupied with opening paint cans, stirring paint, handing out brushes, washing kids’ hands and wiping paint spills from the concrete basement floor. See, I really was busy taking photos, here of Hannah. 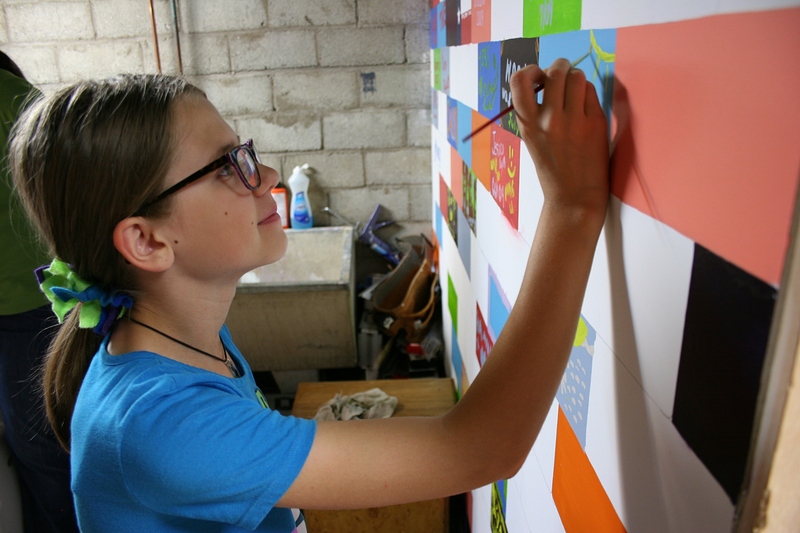 She’s quite the artist who not only paints, but also sews. Plus, she writes poetry. Oh, and she made that pony tail holder in her hair. My excuse of “I’m busy taking pictures” wasn’t sliding by Billie Jo. Nope. So, eventually, I set down my camera and picked up paintbrushes to paint a clutch of lilac hued flowers, my name and the year onto an orange brick painted upon a sheetrock wall. I’ve never pretended to be an artist, except perhaps in photography. 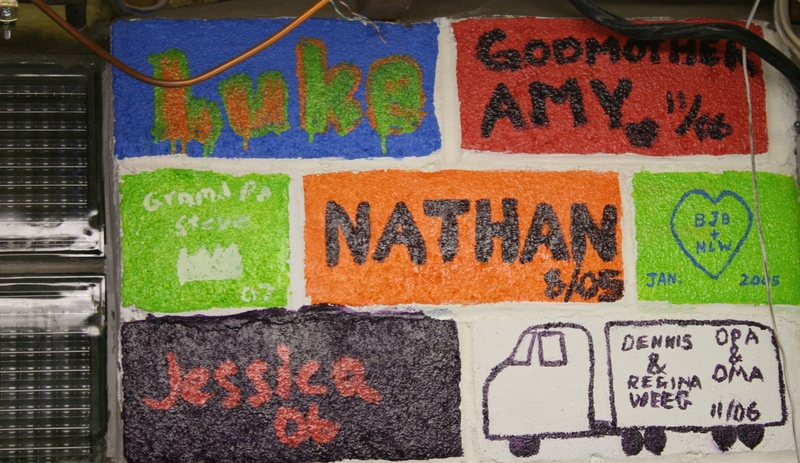 Where the project started, on the cement walls. 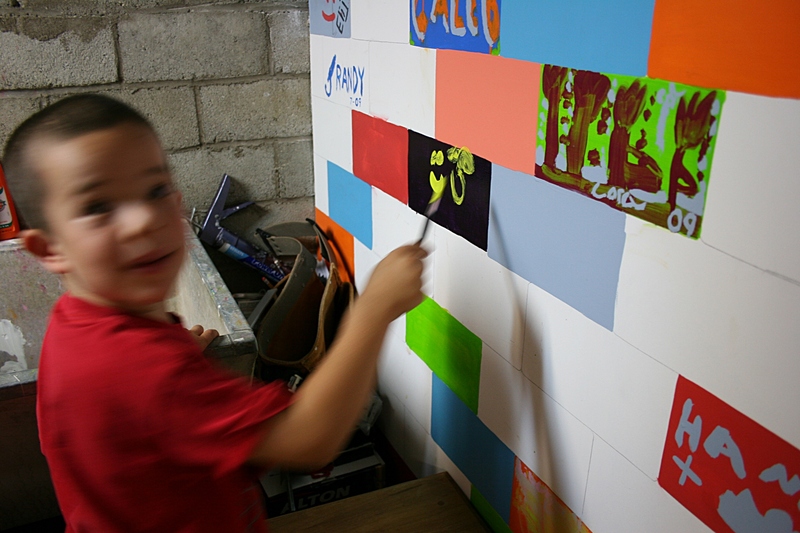 Prior to the sheetrock dividing wall construction, visitors to Billie Jo and Neal’s south Faribault home created art (a record of their visits) on a cement block wall in a corner of the basement. That area is now covered by totes in a storage room stocked full of board games, art supplies and more. “Garage sales are great,” Neal says. 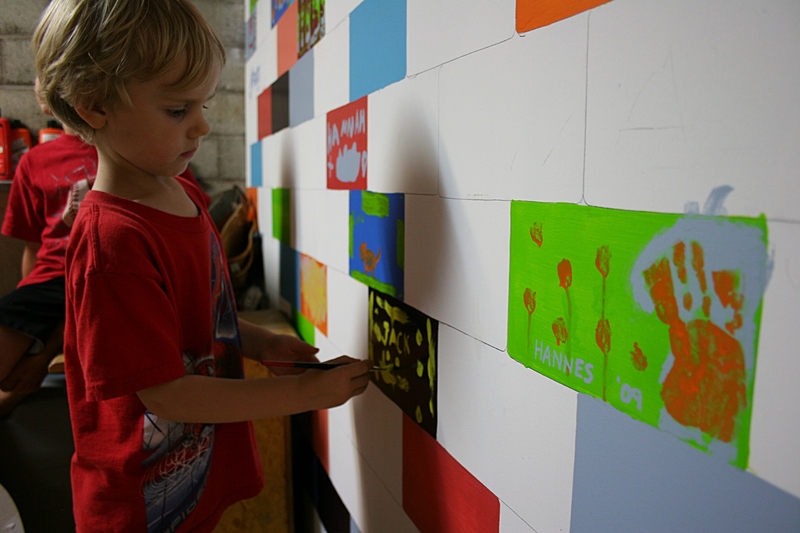 Braxton, in near constant motion, took time to paint. And so are he and Billie Jo and their kids, Nevaeh (heaven spelled backwards) and Braxton. I love how they parent, reminding me of bygone times. They have no television, instead choosing board games and crafts and bike rides and storytime at the library and such to define their family togetherness. My friends stretched a wood plank between their deck and an outdoor play cube for the kids to jump and run and do whatever kids’ imaginations tell them to do. The plank was added when Braxton was in his pirate phase. Fun times for Hannah at Billie Jo and Neal’s mud party. The event included mixing of “potions” at the picnic table. Photo courtesy of Billie Jo. 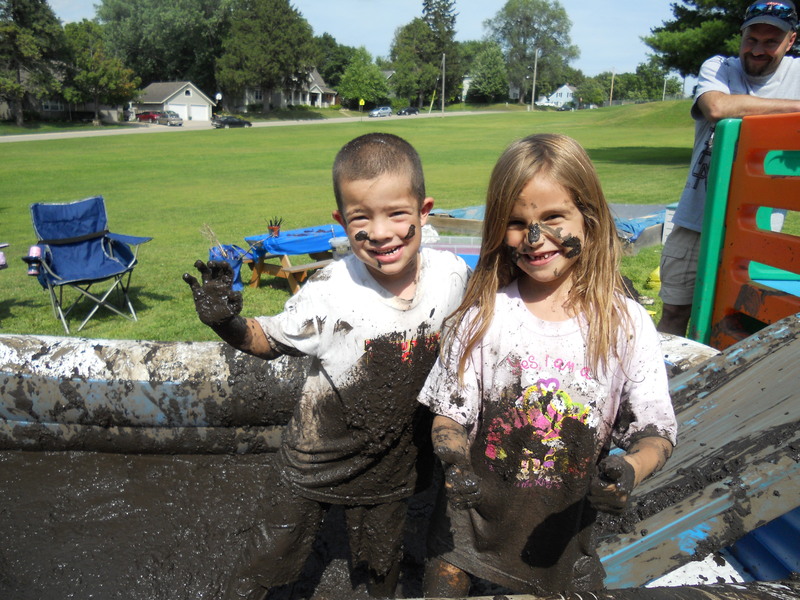 Recently, they hosted a mud party, as in purchasing black dirt, shoveling it into a kids’ swimming pool, mixing in water and letting Nevaeh and Braxton and friends muck around. Billie Jo tells me that clean-up lasted longer than the party. Here Braxton and Nevaeh pose. Photo courtesy of Billie Jo.